This lovely ‘beach sculpture’ was photographed on Knoydart in north-west Scotland. 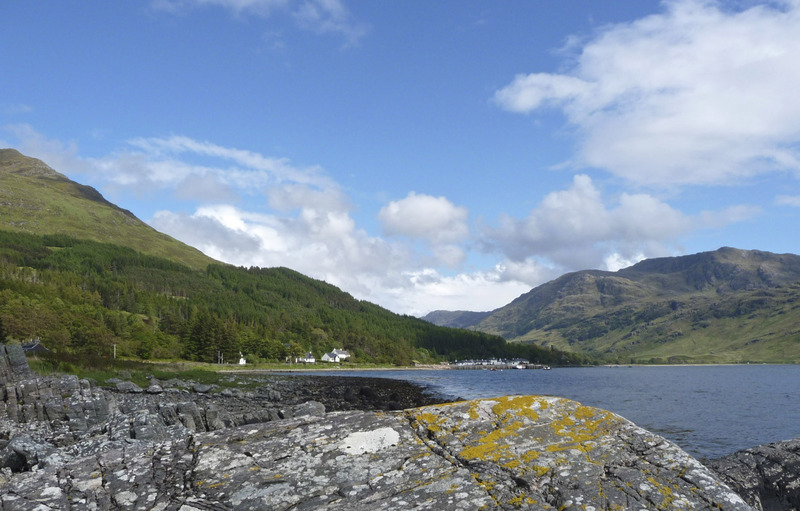 The smaller photo shows Knoydart’s only village, Inverie. This whole peninsula is a cross between a wilderness and a paradise. Unless you fancy a two-day hike over the hills, you can only get there by ferry from Mallaig. More information on the Visit Knoydart website. Thank you, Lynne! I love them too. Oh the childhood holidays in Scotland that this brings back! It’s just divine isn’t it. I know, Anny! Glad it brought back some happy memories! I love seeing rocks like that, made smooth by wind and wave. That first photograph makes me want to reach out and touch it. The photo of Knoydart is beautiful. I agree, Lorna, there’s something about these natural rock formations that always gets my attention! I wish I knew more about the geology, too.